I enjoy deconstructing the latest diet trends, and Paleo approach is in the hot seat in this article. The last time humans were on the authentic Paleo diet, dinosaurs may have roamed the earth. 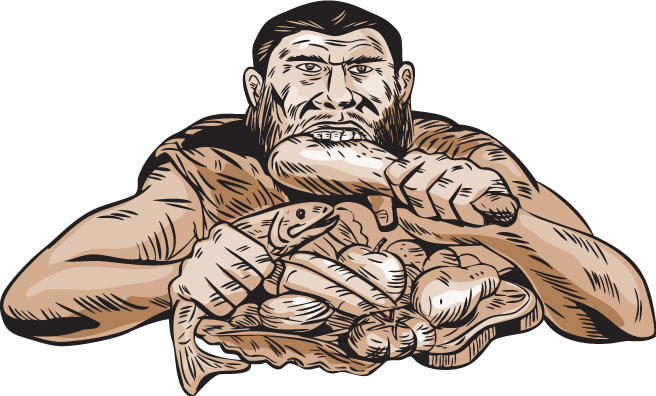 The name Paleo comes from the assumingly the prehistoric Paleolithic period. Seems like we have gone full circle and now we are back to eating like cavemen. Only now we don’t have to hunt our prey. Is there something mysteriously attractive about the idea of sitting around campfire and enjoying daily catch? These days the campfire fare sadly typically consists of hot dogs and marshmallows sandwiched between chocolate and graham crackers. The focus of the diet it on the unprocessed foods, much like what the people ate tens of thousands of years ago. Thus avoiding dairy, sugars and grains. A typical day consisted of grazing on nuts, berries and some vegetables and hopefully a large meal of some wild animal. There are many variations of this approach based on people living in different parts of the world and modern day adaptations that include many new cooking methods that didn’t exist thousands years ago. Some of the names i’ve heard: Primal, Caveman, and dr. Sarah Ballantyne aka “The Paleo Mom” takes it to the next level with the Autoimmune Protocol or AIP. The reality is that the scientists and researchers keep coming up with new data on what people really ate back in the Stone Age. Nobody can say with 100% certainty what the diet consisted of, and the time machine … well let me know if you hear of a working one and we can take a trip back in history. But we know for sure they didn’t have Twinkies or pasta. Let’s explore the Paleo approach. You can enjoy eating organic, grass-fed or wild caught lean meats and fish that provide your cells with the necessary proteins. Staying away from processed foods, sugar and salt that rob you of energy. A wide array of berries, root vegetables and nuts will nourish your body and add healthy fats into your daily regiment. Too much focus on eating animal products that in current farming practices have more fat, and potential for added antibiotics and growth hormones. Also consuming too much protein has its own negative effects, placing extra stress on the kidneys. Long periods of fasting between meals may not be realistic in the demands of today’s society on our bodies to function and be active for 12-18 hours a day. Excludes entire food groups, like legumes and grains that may contain vitamins and minerals necessary for some people. Paleo approach offers some great benefits, my favorite being the elimination of sugar and processed foods. Back when caveman were enjoying catch of the day, they weren’t concerning themselves with what the animals ate or how they were raised. They didn’t have large supermarkets and marketing campaigns promoting foods that make us fat and sick. Your biggest takeaway should be to minimize the consumption of processed foods.